Adam Kraut, a firearms law attorney in Pennsylvania, is running for the NRA Board of Directors again this year. He qualified to be on the ballot by petition under the new, harder rules. Last year, he was about 60 votes shy of being the 76th Director. I supported Adam last year and I plan to vote for him again this year. I had dinner with Adam at the 2017 NRA Annual Meeting and came away impressed. I have spoken to him a few times since and his knowledge of firearms law has been helpful to me with my blogging. Frankly, we need energetic young people who will rock the status quo on the Board of Directors. In addition to running for the Board, Adam has promulgated four bylaw changes that I think are well worth your time examining. The first proposed bylaw would require a candidate for the Board to run by petition-only after serving two consecutive terms. They would not be eligible to be nominated by the Nominating Committee. Think of it as a soft term limit. They wouldn't be precluded from serving more than two terms on the Board but would be required to go to the voting members and get their support if they wanted to serve a third term or more. The second proposed amendment would require attendance at two out of three Regular Meetings in order to be renominated by the Nominating Committee. Proposed Amendment Two would require that a Director attend two of the three Regular Meetings held each year or lose their eligibility to be nominated by the Nominating Committee. There is a provision which would allow for an excused absence due to 1) a medical emergency, 2) death in the family, 3) natural disaster, or 4) their flight, etc. being canceled by the provider (eg. airline). However, if a Director were to miss three or more successive Regular Meetings due to a medical emergency OR two or more successive Regular Meetings due to the other 3 exemptions, they would be ineligible for consideration by the Nominating Committee. The third proposed amendment would amend the section of the Bylaws pertaining to the Nominating Committee to contain these restrictions on nominations while the fourth proposed amendment would create an Honorary Board whose job would be to advise the Board of Directors as their time permits. This would be an ideal place to put the celebrities. It is akin to what many colleges and universities have with a Board of Trustees (the BOD) and a Board of Advisors (the Honorary Board). Look at the three charts below to see the current attendance records of the existing Directors. Some directors take their job very seriously and some are flat out slackers. The worse offenders seem to be the celebrities and the politicians. If you want the honor of serving on the NRA Board of Directors, I think it is incumbent upon you to get yourself to the meetings. Time conflicts should generally be resolved in favor of the Board meeting. 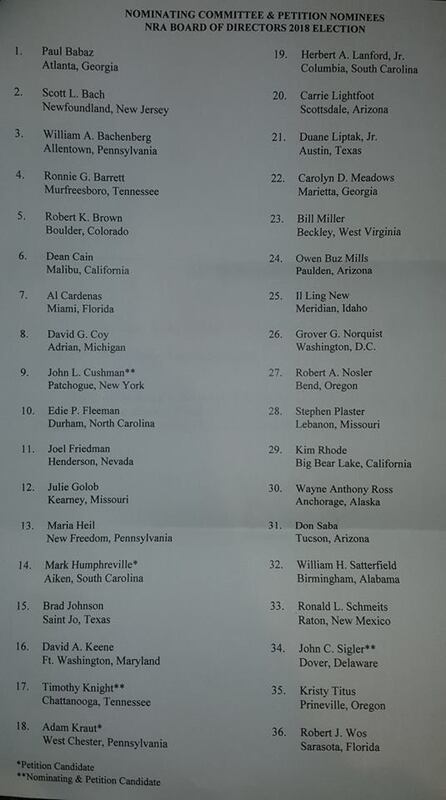 Below is a copy of the ballot that will be sent to Life and 5-Year members with the February issues of the official NRA magazines (American Rifleman, American Hunter, etc.) 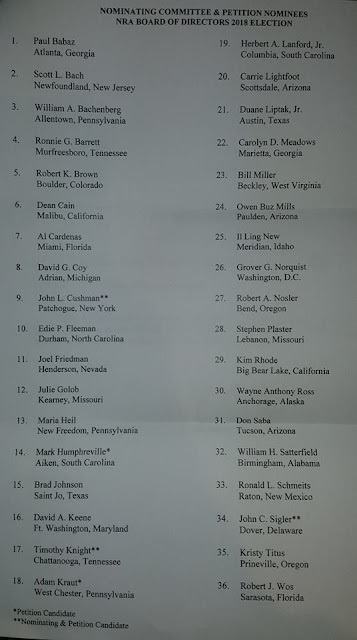 You will note that only two candidates are on the ballot solely by petition and another three who were both nominated by petition and by the Nominating Committee. I would give strong attention to the attendance records of existing Directors when casting a vote. By my count, only nine of the Class of 2018 Directors have a perfect attendance record which is and of itself embarrassing. Adam has created a page with short videos on his amendments, the attendance issue, and how to fill out the bylaw petitions. You can find it here. I have served on boards ranging from a quasi-judicial board dealing with zoning adjustments to the Catholic Social Services of the Diocese of Charlotte Board of Directors. All of these boards were composed of work horses and not show horses. 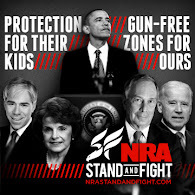 That is how it should be with the NRA's Board of Directors. The enemies of gun rights are getting increasingly sophisticated in their attempts to abridge our civil rights. We need a Board of Directors that not only shows up but can be proactive rather than reactive to these threats. Ouch, I didn't realize it was that bad, and after seeing the spreadsheet, I agree!